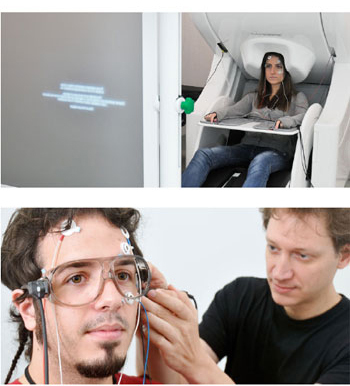 Magnetoencephalography (MEG) provides a non-invasive method for recording cortical activity with exceptional temporal resolution and fine spatial resolution. The MEG facility at the BCBL is a 306-sensor (204 planar gradiometers and 102 magnetometers; arranged in a helmet configuration)Elekta Neuromag® device with 16 digital trigger lines and 8 auxiliary analog input channels. The setup will allow for the delivery of both auditory and visual stimuli, and recordings can be performed in either supine or sitting position. The MEG device also includes an integrated 64-channelEEG system (60 single channel and 4 differential electrodes) for simultaneous MEG and EEG recordings that can be acquired at a sampling rate of up to 8 kHz (5 kHz standard) in either AC or DC. Throughout the experimental session, a participant’s head position within the scanner is sampled so that the data can be linked to independently acquired anatomical MRI images. The facility at the BCBL includes passive shielding to reduce external noise, as well as MaxFilter™ software, which filters artifacts as well as internal and external noise sources. For data analysis, the Elekta Neuromag® includes advanced analysis software, including powerful tools for visualization and source modeling of the recorded data.